Today’s the last day of the The International DOTA 2 2013 Championship Tournament. DOTA stands for Defense of the Ancients, which was a free mod for Blizzard’s “Warcraft III: Reign of Chaos” and the expansion “Warcraft III: The Frozen Throne”), nearly 10 years ago. In 2009, Valve (known for the Steam distribution client and the Half-Live series of games) hired “Icefrog”, the maintainer of the DOTA Warcraft III mod to create DOTA 2 built on Valve’s Steam engine. DOTA 2 was in beta for quite some time, with players needing invites to be able to download and play the game. 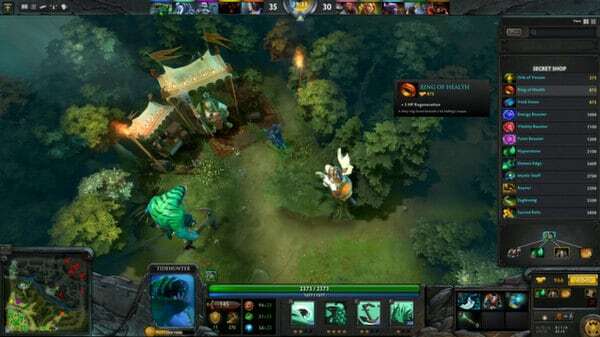 However, DOTA 2 is now out of beta and available on Steam for Windows, Mac and Linux as a free to play game. Dota 2 consists of session-based online multiplayer matches, in which two teams of five players attempt to destroy their opponents’ fortified strongholds. Each player controls a “Hero” character and, over the course of an individual game, focuses on improving their hero’s abilities, acquiring items, and fighting against the other team. Dota 2 combines the real-time strategy elements of a traditional top-down perspective, while also incorporating the leveling and itemization functions of a role-playing video game. Players are pitted against each other as two factions called the “Radiant” and the “Dire”. The Radiant faction is based at the southwest corner of the map, while the Dire faction is based at the northeast corner. Utilizing one of six selection modes, players choose one of 102 “heroes” – strategically powerful units with special abilities, who, through combat experience, may progress to a maximum level of twenty-five. The heroes’ methods of combat are heavily influenced by their primary property, which can be strength, agility, or intelligence. The basic setup of Dota 2 places two strongholds containing critical structures called “Ancients” at opposing ends of a geographically balanced map. These bases are connected by three main paths (referred to as lanes), which are guarded by defensive towers and groups of units commonly referred to as “creeps” which traverse their lanes, attacking enemy units and structures upon sight. Players are split into two teams, each consisting of up to five players, to compete as the primary defenders for each Ancient. The overall objective of each match is to battle through the opposing force’s defenses, and destroy the opponents’ Ancient. Because Dota 2 is highly team-oriented, players must coordinate with their teams in order to achieve victory. The towers and stronghold defenses are invulnerable to attacks, so long as the towers nearest to the enemy side still stand, and must be destroyed sequentially – a team cannot destroy the enemy’s Ancient without first destroying all towers leading up to it in any one lane. The currency of the game is gold, which is granted steadily at a slow rate. Gold can be accumulated at a much higher rate by killing enemy units, destroying enemy towers, or killing heroes. Killing units grants gold solely to the player who killed it; killing heroes grants gold to the killer and any nearby allies; and destroying towers gives gold to all players on the team. Killing enemy creeps, heroes, and towers also provides experience, which allows the player’s hero to level up, granting access to more powerful skills and abilities. “Denying” is a feature of the game which allows players to inhibit the enemy’s ability to accumulate gold and experience by killing an allied unit or destroying an allied structure before an enemy can do so. Denying reduces the amount of experience and gold the enemy faction can receive for the kill. Allied heroes may also be denied if they are on critically low health and have a fatal spell applied to them. Featured across the map are units referred to as “neutrals”, which are not aligned to a faction, primarily located in the forests. Located on the southeast side of the river is a boss called “Roshan” who typically requires multiple team members to be killed. Following his death, Roshan will drop a powerful item which allows for a hero to instantly respawn if they are killed. “A critical vulnerability has been identified in Adobe Reader 9.1 and Acrobat 9.1 and earlier versions. This vulnerability (CVE-2009-1492) would cause the application to crash and could potentially allow an attacker to take control of the affected system. A second vulnerability has also been reported that appears to affect Adobe Reader for UNIX only (CVE-2009-1493). According to a security advisory from Adobe , Adobe Flash v10.0.12.36 (and earlier versions of Adobe Flash 9) on all platforms has a vulnerability “that could allow an attacker who successfully exploits this potential vulnerability to take control of the affected system” – meaning malicious software could be downloaded and run on your machine if you visit a website with malicious Flash content file or video (SWF) . To determine what version of the Flash player you have, visit http://www.adobe.com/products/flash/about/and to install the latest Flash player go to http://www.adobe.com/go/getflashplayer. Windows users should note that the Flash Player in their Microsoft Internet Explorer browser and the one in other web browsers like Opera, Mozilla Firefox, Google Chrome and Safari are separate installs. You should install and update both versions, by visiting http://www.adobe.com/go/getflashplayer in Internet Explorer and then with your other web browser. Adobe Flash Player 10 for Windows, MacOS X and Linux. Software Freedom Day (SFD) 2008 will be on September 20th, 2008 and the Trinidad and Tobago Computer Society (TTCS ; http://ttcsweb.org/ ) needs your help. What is Software Freedom Day? on the third Saturday in September. Local Linux users, Windows users, Mac users, fans of open source software, everyone is welcome to assist with this project. please go to the planning page for further information and/or to add your contribution : the TTCS SFD 2008 wiki page at http://files.ttcs.tt/ttcs-wiki-sfd2008-planning.pdf and email admin at ttcsweb.org. Notes of meetings will be posted to the planning page with the first virtual one scheduled for July 27, 2008. Further details will be posted to the SFD2008-planning page as well as via email to those persons interested in helping with SFD2008. Version 3 of the multi-platform web browser Mozilla Firefox will be released on Tuesday 17th June 2008. The non-profit Mozilla Foundation is attempting to set a Guinness World Record for the most software downloads in 24 hours on Tuesday 17th June 2008. Firefox v3 has several improvements, not just in features but in the speed of loading webpages. Check out this screencast of some of the features in Firefox 3. There is also a Field Guide to Firefox 3 with many screenshots. To help with the record, visit http://www.spreadfirefox.com/worldrecord and click on the red “Pledge Now” button. You will be asked to select what country you are from (and yes, Trinidad and Tobago is listed as one of the countries) and optionally your email address (for the Mozilla Foundation to keep you informed on Tuesday) and click the Pledge Now button. By doing so, you are pledging to download Firefox 3 on Tuesday. If you’ve haven’t updated your Adobe Flash player since April 8th, 2008 to version 9.0.124.0, please do so as there are several exploits targeting older versions of Flash. To verify the Adobe Flash Player version number, access the About Flash Player page, or right-click on Flash content and select “About Adobe (or Macromedia) Flash Player” from the menu. Customers using multiple browsers are advised to perform the check for each browser installed on their system. Ubuntu v8.04 Long Term Support Edition (aka Hardy Heron) has been released. You can download it at http://www.ubuntu.com/getubuntu/download. Hopefully we’ll get all the versions before our Ubuntu Launch party this Saturday! There is also a desktop tour of the features in Ubuntu 8.04. The Trinidad and Tobago Computer Society (TTCS) will be having a tech meeting on SATURDAY April 26th, 2008 from 1-5pm at Engineering Consultants at 112A Edward Street, Port of Spain (corner of Oxford and Edward Streets).At this meeting, we will be demonstrating the latest release of Ubuntu v8.04 LTS, a community developed operating system for desktops, laptops and servers. Persons interested in computers and related technology are welcome to attend. While stocks last, attendees will receive a Ubuntu CD free of charge. Contribution of $20 towards refreshments is expected. Copies of TTCS OSSWIN CD are available for $20TT. As mentioned before, many of the public ICANN meetings have transcripts available within hours after the meetings as text files. However, a disadvantage with viewing the ICANN New Delhi 2008 meeting transcripts with Mozilla Firefox such as the transcript for “Workshop: Update on Internet Governance” held on February 11th, 2008 is that the length of the lines of text are too long for the browser window requiring you to scroll left and right to read the transcript which gets confusing with the likely result that you stop reading the transcript online or try to insert the text in a word processor or text editor to word wrap the text. If only there was a way to word-wrap the text in the browser window………….. Locate the sub-folder called chrome in your profile folder. See http://www.mozilla.org/support/firefox/edit#profile on how to find where Mozilla Firefox stores the profile folder for different operating systems. Save the file, and restart Firefox for the changes in userContent.css to take effect. With this change, any text files you view in Mozilla Firefox will automatically be word-wrapped so that you don’t have to scroll left and right to read the text file.